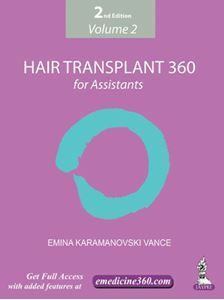 This book covers the basics of hair anatomy and hair growth cycles necessary for assisting in hair restoration. Male and female pattern baldness, nonsurgical hair loss solutions, and the evolution of hair restoration along with surgery overview and surgical assistant’s duties have been covered. Various techniques such as graft preparation (magnification and lighting, donor-harvesting techniques, graft survival and tissue preservation, managing difficult situations during graft preparation, quality control), slivering (technique, instruments used, slivering strategy, tissue preservation), graft dissection (technique, instruments used, dissecting strategy, graft preservation), graft extraction (technique, instruments used, extracting strategy, tissue preservation),graft placement (technique, choosing the forceps, placing principles and strategies, proper graft handling and preservation, quality control, managing difficult-placement situations) have been included. Postoperative care, short- and long-term patient follow-up along with assistant training: Phase I and II ( consisting of new inanimate models) are explained. Chapters 2 to 7 contain video(s).